That third one is a kittenhead staircase! Aney... such a lovely site. If only I could be underneath that puddle......sigh. They are all such cuties, but I have to say I always look for Lambert, because he always looks so serious (our youngest boy Gus is the same way - even happy and purring that face is still serious). Oh my goodness....those babies need to be puddles up in a bed!!! So cute! It looks like Fiona had to dig herself out by the third picture. Maybe she runs hot like me. You have amazing self control. I would have been unable to resist sticking my face in the middle of the puddle. 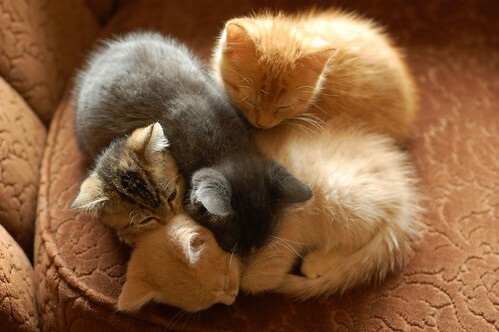 The first photo looks like a quilt of kitties. Precious! Love how they all stick together to form one lump. Sweet. What can I say except for aaaaaawww? It's as if they have only two speeds: ON and pile on. Awww, what a lovely sight for a Friday (well Okay, it would be an awesome sight any day or night). Oh oh WOW!!! I can't even comprehend the wonderfulness of these pictures... especially the first two... those sweet babies in the sunlight!!! My word. 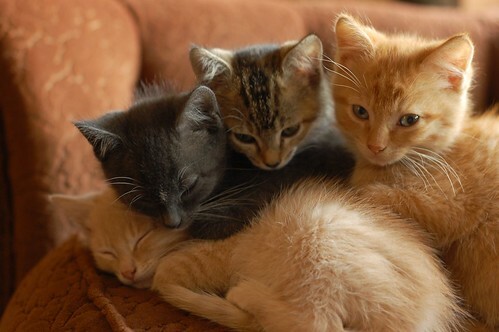 I too would like to be under that kitten cuddle. I just hit my head on the monitor trying to cuddle these cuties. Definitely a Cuteness Overload Alert. OMC that's just adorable! Squeeeeeeeeeeeeee! 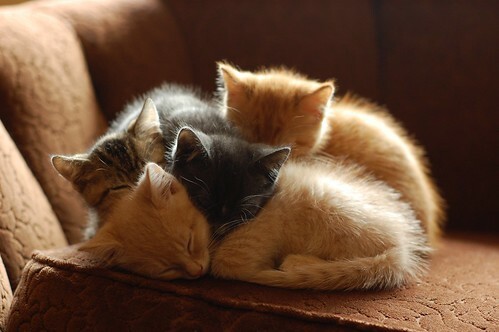 awwww...what a lovely lovely bunch of lovely furry kitties..I want to snuggle with them too...ssooo sweet.. Does this look like an October puddle, or what? How did you manage to match your kittens to the season? Oh god, they're so sweet! Knowing what we now know about Lambert, is it safe to say that his brothers and sister are holding him down? awww shucks, they all look soo adorable. Are the kittens in this picture the same kitties as the ones in this video? I just "stumbled" onto this blog! These kitties are adorable! My goodness... they are so cute. I love cats! 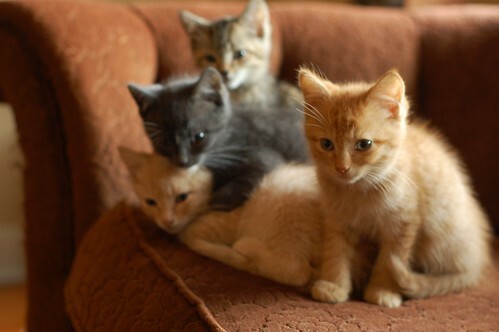 Cute fluffy kittens! The pictures is so warmhearted!